The castle isn’t the only excitemente in the children’s area of this library. There are many other things to discover. This may be one of the most fun children’s libraries we’ve visited so far. The fun begins even before you enter the children’s area, with a wonderful book archway. M-girl excitedly prepares me a meal with every imaginable: vegetables, fruits, and even a taco. And of course, she couldn’t forget a doughnut. The preschool children’s area is lovely, full of fun toys to discover, including a puppet theatre and puppets, a very nice kitchen, all kinds of rhymes on the wall, and more. And the best part: a doorway into an outdoor library playground. The fun continues with puzzles, games, a doll display, and even a green screen. The dragon’s den is a lot of fun, too. K-girl reads piles of books as usual; the little ones read books with Daddy, and Mama finds a quiet place to work for a while. 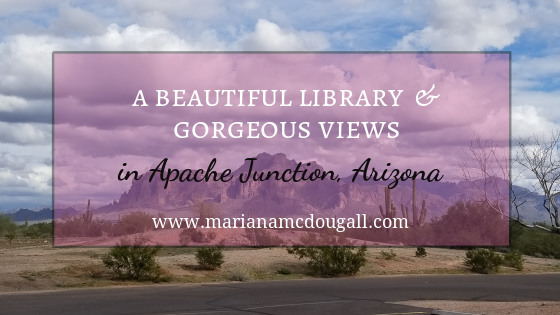 This library is truly wonderful, but in Apache Junction, it’snot just the indoor spaces that are enjoyable. Even the library parking lot has a great view. We enjoyed Apache Junction so much, we returned a second day. I would love to return to this area regularly—both to enjoy lots of time at this wonderful library, as well as to revisit Goldfield Ghost Town. 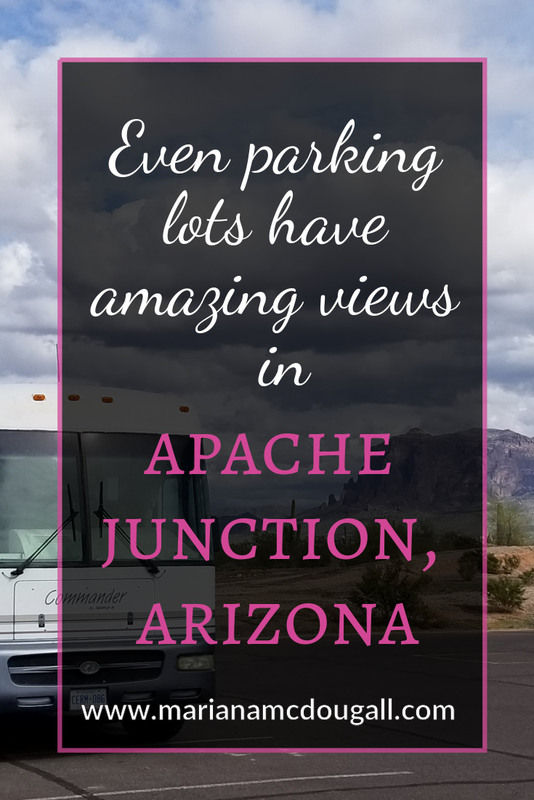 Apache Junction is a beautiful desert location, and we fully enjoyed our time here. It really was a great place; I really enjoyed it there. I’d like to come back one day to spend more time here. Revisit Goldfield Ghost Town, spend lots of time at the library, and just stare at the mountains for a while. Thank you so much for supporting my writing by reading and commenting on my blog, Marg. It means a lot to me.